Today’s Guest Post is something a little different, but I like to give inspiration to everyone who happens to visit Love Chic Living. Maybe these ideas are perfect for your rebellious teenage daughter! Whilst many think that nothing would be more perfect than having a crisp and bright bedroom that looks like it was lifted straight off a home décor magazine, many others want something that is far more unique that has a splash of personality. Introducing elements of gothic inspired themes and features is a perfect way to bring life to an otherwise bland or characterless room; and in this guide we tell you just how you can achieve this within your bedroom. Gothic style incorporates a wide range of varying furniture designs and is far more varied than many people believe; from dramatic, sweeping silver curtains coupled with furniture that has elegant lines, to rooms that feature a bold feature colours, black furniture and haunting pictures with Victorian styled frames. So before you start take your time to research what styles you like and what you think could be implemented well within your bedroom. A gothic inspired room isn’t about painting your room totally black, it’s about using bold colours wisely; this is particularly important if your room is relatively small, as you’ll need to keep most of the walls light in order to keep the room looking spacious. Commonly used colours for gothic rooms include silver, deep purple, black, or possible royal red or blue. Ornaments are both a cost-effective way of recreating a gothic feel as well as an authentic one; key pieces include large candles, dramatic candle holders, cushions in rich textures and plants. For the latter you shouldn’t be thinking green house plants, rather you should be looking at delicate flowers featured in metallic pots. Large paintings with mysterious landscapes will work wonders for creating a gothic feel; it will also create interest and a focal point within your room. You may also wish to try ‘Phantom of the Opera’ based masked if you’re looking for a more minimal and less detailed feel. Given that your bed takes up the largest proportion of your room dressing it in bed sheets that create a mysterious and romantic feel is one of the best ways to achieve a gothic look. Try looking at dark sheets and covers with a silky finish and adorn your bed with contrasting textured cushions. Key colours to look at here are dark mauves, purples, reds and blues. Buying a rug can create maximum impact with minimal cost; you needn’t purchase brand new, just search your local rag market or check eBay for a uniquely patterned rug. If you can only afford to decorate your bedroom one piece at a time then a key piece of Boudoir based furniture should be your first choice. For the most impact chose a large chair or chaise lounge featuring a deep, red texture fabric that is framed by black, detailed wood. 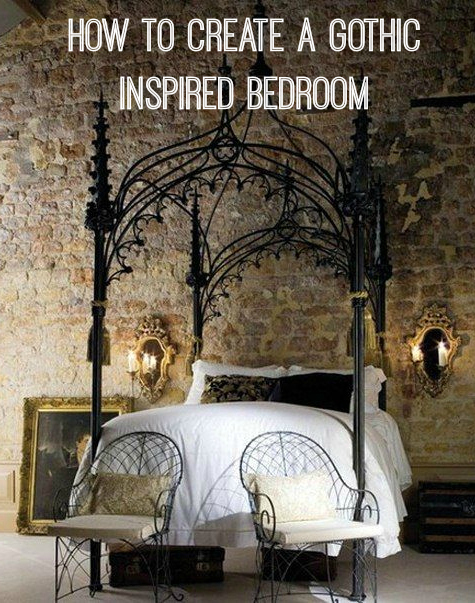 A gothic based bedroom can be something both stylish and also incredibly striking. So, take some guidance from the above tips and give it a try. I used to have a signature red wall in my bedroom and it had a gothic vibe. I love drama and the gothic style.